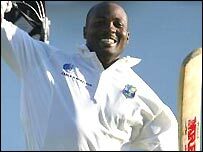 Brian Lara has set the highest score ever in Test cricket, hitting 400 not out in the fourth Test against England. Lara passed the previous best of 380 by Matthew Hayden and then declared after reaching the quadruple century. The Trinidadian left-hander faced 582 deliveries, hitting 43 fours and four sixes, setting a new mark just over two hours into the third day in Antigua. The feat came on the same ground where he hit a then record 375, also against England, in 1994. Lara, who resumed the day 313 not out, shared an unbroken partnership of 282 with Ridley Jacobs, who hit a century himself to leave the home side 751-5 at the post-lunch declaration. The shots that will stick long in the memory came off consecutive balls in a Gareth Batty over shortly before lunch. Lara equalled Hayden's score by lofting Batty over long-on for six and then topped the mark with a swept four past fine leg. And he revealed Hayden had been in touch with him. "Matt said he had been listening to it and was very happy for me," said Lara. "He enjoyed the period he had the record and I am sure he is capable of doing it again, as are a lot of very good batsmen around the world, and I really appreciated that he took the time out to make the call." During the day Lara passed Australian legend Sir Donald Bradman's personal best 334 and the English record 364 set by Sir Leonard Hutton in 1938. He did survive a possible chance on 359 when what appeared to be a nick down the leg side was dropped by debutant wicket-keeper Geraint Jones. Across the Caribbean, in Lara's home village of Cantaro, Trinidad, 52-year-old Freddie Gordon was watching the action on TV in the Valley Bar. "The man was a perfect cricketer from when he was a baby," said the local car mechanic. "He has got his crown back within 10 Test matches of losing it"
"The rate I was going at I always knew it was possible"